Hey gang! I haven’t been as lazy as it seems, I swear. I’ve been working on a massive essay-type post that isn’t quite ready to post yet, so here’s a little something to entertain you (hopefully) in the mean time. I went to see the new Captain America movie yesterday (I really liked it! 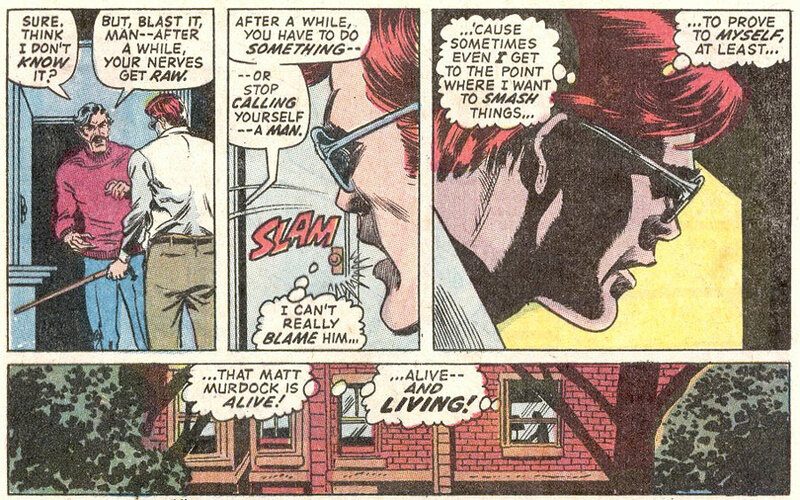 ), so at first I thought I’d post something Natasha-related. Then I realized that there are some delightful absurdities involving Matt’s first meeting with her chauffeur Ivan that needed to be ridiculed. 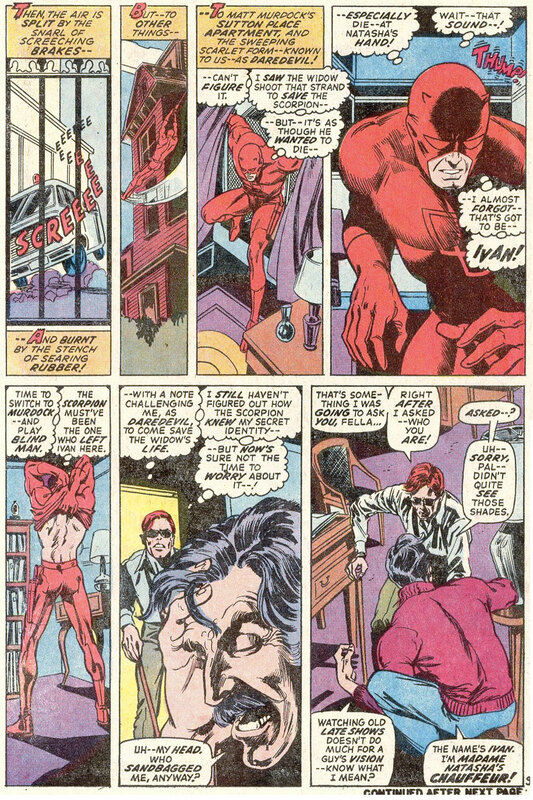 The scene begins with just some minor absurdities, such as the fact that blind people don’t generally use a cane in their own homes and aren’t expected to (a common head-scratcher in early Daredevil), as well as the weird notion that Matt wouldn’t notice if there was someone in the room watching him. He can easily hear heartbeats, not to mention relatively louder breath sounds, and it’s unlikely that someone would have had the time to mount some kind of elaborate camera equipment for remote viewing. 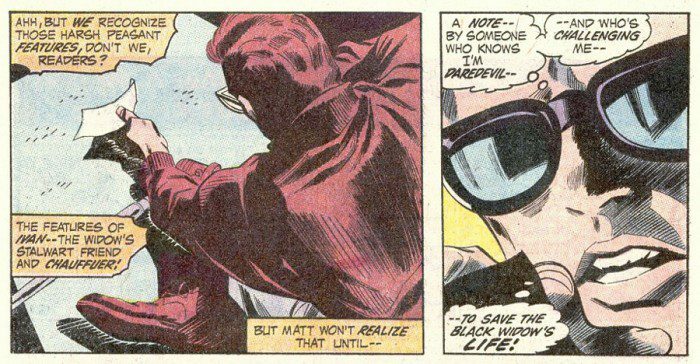 Matt now rushes off to save the Black Widow who has been kidnapped by the Scorpion. 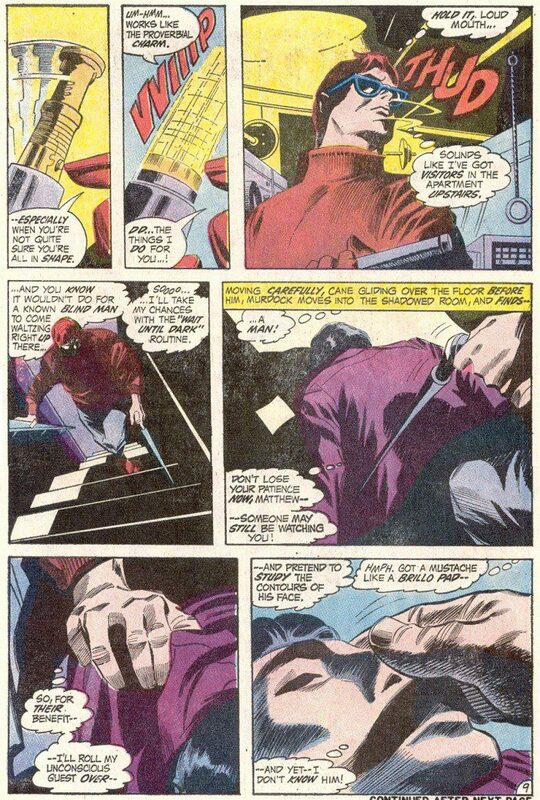 The trio end up fighting on the top of a tall building and just as the villain falls to his death while Natasha is trying to save him, the most annoying crime scene witness ever shows up in time to misunderstand the whole thing and accuse her of murder. Somewhere along the line – I forget where – Ivan entered the conversation between Matt and Natasha which means that Matt has put two and two together and figured out that the man in his home is Ivan. But, the two haven’t been formally introduced so it’s perfectly reasonable that Matt would ask Ivan who he is. Really, I don’t care how distraught Ivan is, this is not normal behavior. Ivan needs a psychiatric diagnosis or at the very least some serious anger management therapy. 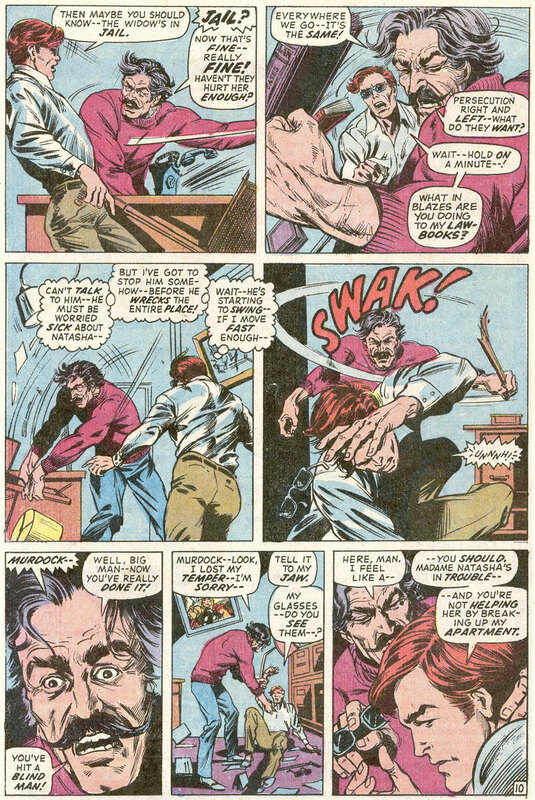 At the realization that he’s hit a blind man, which I think is presumably more frowned upon that beating up a kid with glasses, he comes to his senses. Matt meanwhile, is amazingly forgiving. That’s it for now! I will return shortly with something quite a bit more profound. Yeah, it did seem weird. I didn’t have much of an investment in Ivan, and I thought the rest of the series was fun … but yeah, weird. The main antagonist did rather put a crimp in the fun. The movie version of Captain America: Winter Soldier lives up to the hype. Totally enjoyable and it’ll be a massive hit.